These creepy little pests are usually mistaken for cockroaches. They are about 4 cm long and have flat dark brown bodies. Unfortunately they are much nastier then cockroaches because they feed from human blood which makes their existence near people not only annoying but a health hazard as well. The adult bugs are very resistant and with time they have already develop immunity to the usual pesticides people use to get rid of them which makes their extermination even harder forcing pest control specialist to be creative in their work. Small, young bugs are brighter in color and not so resistant, but they can survive for couple of months without food, while adults can even survive up to a year. When it comes to breeding, female bug can have from 300-500 eggs. The eggs are very sticky so she can literally hide them anywhere in your home, and after hatch, the young ones need approximately one month to become fully grown. As Mother Nature has made possible for these insects to develop intelligence through years of evolution, they are rather smart. During the day they hide in safe places but never too far away from food source, and during the night they come out to eat. This is why it is not that simple to notice that these unwonted guests have moved in so you need to be careful and look for the symptoms of bed bugs. Here are some symptoms of bed bugs in your home. 1. If you can see bites on your body that get smaller over time. 2. 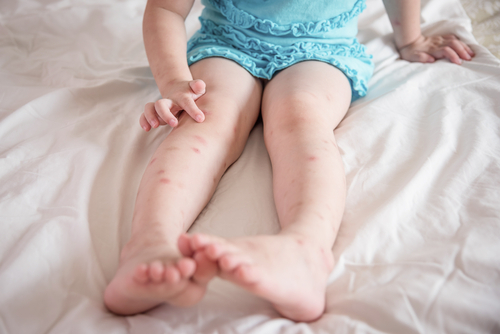 If you are itchy at night that may be a symptom of bed bugs. 3. Sometimes you can see darkened patches on the bed cover which are caused by the bugs excrement. As much as their traveling from one host to another is very easy because they tend to hitch a ride on peoples clothes and personal possessions, getting them out of your home is a hard and exhausting task. Mainly because they multiply very fast and if you do not exterminate them 100% efficiently, soon they will multiply again and all your work will be in vain. If you are not ready to cope with these insects yourself, it is best to look for help of a professional exterminator. 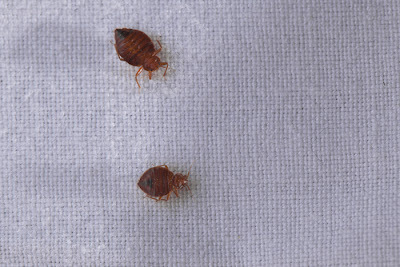 When it comes to bed bug control, many people don't realize that they need help. Because of their small size, you may not actually see them and explain away any symptoms you experience. Unfortunately, the longer they are overlooked, the more of a problem that they can become. They are difficult to get rid of and sometimes, even throwing away sheets, comforters, or furniture will not solve the problem. If you are experiencing any type of unexplained bites, it might be time to have a bed bug control company come in and take a look around. As with other insects, you probably won't be able to see them actually do it, but you will experience a red welt where it took a bite. Family members experiencing something this this can cause rashes, other reactions and can make sleeping uncomfortable. As with other insects, these creatures molt. You may find an accumulation of these skins somewhere in your home, giving you a clue that it is time to call for bed bug control. Again, because they are small, you are looking for smaller, clear colored skins. They molt often (at least six times) before they become fertile and are able to reproduce. Look around your home for areas of clutter. Just by moving some piles around, you may be able to find some of them out and about. Also, check all around the mattress, under the mattress and in all of the crevices. You may be able to find some of them hiding in hard to reach or hard to find places. Also, check around the baseboards of the room. This is another great place for them to wait until the next time they feed. If you are sure that you need bed bug control, you need to make a phone call as soon as possible. Even if you aren't sure that you have an infestation, it could be worth it just to have someone come out to take a look. Professionals typically know exactly where to look and can confirm that you may need some assistance. Unfortunately, because they are pretty resilient, they are difficult to get rid of. While there are some ideas for how to handle the situation on your own, most of them are ineffective. These creatures can live for an extended amount of time without coming out of hiding. You may think that they are gone, by in essence, they are just taking a little break and will be back out in no time. Usually, there are chemicals that need to be used inside of the home. You want to make sure that someone that knows what they are doing handling these types of things. People inexperienced in this area may cause more problems than solutions. Again, even if you suspect that there is a problem, it cannot hurt to have someone come in and take a look. At the very least, it will give you some peace of mind.